Rapper TI stepped off a motor coach bus on Wednesday evening to start serving the rest of his time in a halfway house for a probation violation and he already has a new book deal and TV reality show waiting for him. The artist, whose real name is Clifford Harris, earlier left the Forrest City low-security prison in Arkansas, Bureau of Prisons spokesman Chris Burke said. "The storm is over & da sun back out. IT'S OUR TIME TO SHINE SHAWTY!!!!!" the rapper posted on Twitter shortly after his release. "Welcome to the beginning of our Happy Ending!!!!" TI had initially served about seven months at the prison in 2009 after he was arrested for trying to buy unregistered guns and silencers from undercover federal agents. He was on probation after he was released and ordered not to commit another crime or to illegally possess any controlled substances. He was arrested again in September 2010 in LA on drug charges after authorities said he was found with four ecstasy pills. He was sentenced in October to 11 months in prison for that violation, and had been set for release at the end of September. 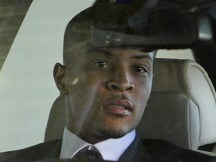 VH1 said on Wednesday that the network will film TI's journey home from jail and debut the show in December. MTV aired a similar reality show on the rapper in 2009 called TI's Road to Redemption: 45 Days to Go, which chronicled his attempts to help others avoid his mistakes. TI has also finalised a book deal. A representative from HarperCollins told The Associated Press that the rapper has written a novel called Power & Beauty, set to be released in October. The arrest on weapons charges came after TI's best friend was killed following a post-performance party in Cincinnati in 2006. The rapper has said the bullets that killed his friend were meant for him. When he was released from that sentence, he was required to perform 1,000 hours of community service, which he spent mostly talking with schoolchildren about the dangers of drugs, gangs and violence. But a federal judge said that "experiment" failed when Los Angeles deputies found four ecstasy pills on the rapper.